Relax Hotel is about 5 Km (approximately 20 minutes) from the airport. It is the best choice for both business and tourist guests. 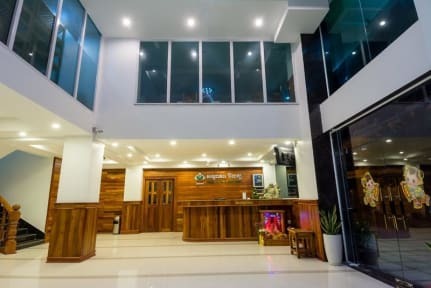 Our location is near main tourist destinations and shopping centers in Phnom Penh such as Tuol Sleng Genocide Museum, Olympic Stadium, City Mall, Olympic Market and Russian Market, etc. Relax Hotel has 13 floors with 72 rooms and 18 apartment units. 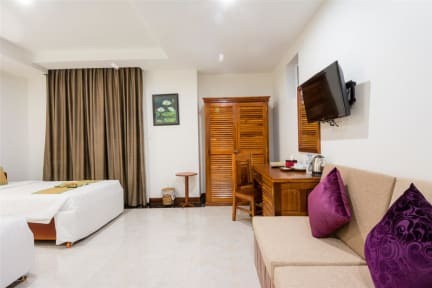 Located in the heart of the Kingdom of Cambodia, all of its hotel rooms and apartment units are designed with windows and balconies. It enables all guests to see the beauty of the whole Phnom Penh Capital City landscape, the Pearl City, from the hotel both day and night. 1. Check-in Time: from 02:00pm. 2. Check-out Time: before 02:00pm. 3. Payment: Cash or credit cad is welcomed upon arrival. (2) If cancelled in 3 days prior to the arrival, the one night fee will be charged. (3) In case of No-Show, the full amount will be charged.